Powerdyne Arius Butterfly Cushions are a split cushions are specifically designed the shape to suit the powerdyne Arius Plate known for its patented design for the split cushion. This split butterfly design cushion delivers a progressive lateral movement which creates an efficient pressure equally on the points of pressure used while skating. Thes cushions can be changed to suit any skating style very easily unlike the traditional skate plate the removal of one bolt will allow you to replace the cushions as require. The Arius butterfly cushions come in a variety of hardnesses to choose from, there is no right or wrong that is why the option of hardness is there. The way to choose the hardness best for you is to know the hardness is known as a durometer which is referred to by number. The higher the number the harder the cushion is. The harder the cushion the less the agility a skater has. Includes one set of eight butterfly cushions for Arius Platinum plates featuring the “winged truck” only. Arius Platinum plates require eight split cushions. 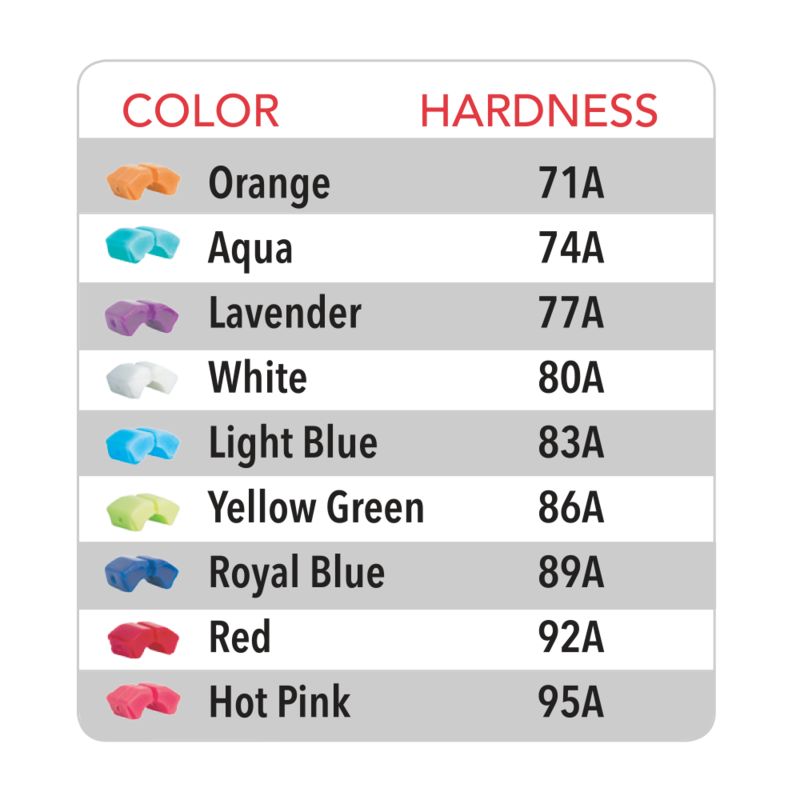 Available in following colors/hardnesses ranging from softest to hardest: Orange (71A) is no long available� , Aqua (74A), Lavender (77A), White (80A), Light Blue (83A), Yellow-Green (86A), Royal Blue (89A), Red (92A), and Hot Pink (95A). The PowerDyne Arius Split Butterfly Cushions are avaialble in 8 hardnessses and can be interchanged to match any skating style. PLEASE NOTE THIS CHART SHOWS ORANGE, HOWEVER IT IS NO LONGER AVAILABLE.